Two astronauts worked to upgrade the International Space Station's power system. Two NASA astronauts performed the first spacewalk of the year Friday at the International Space Station. Flight engineers Anne McClain and Nick Hague began their excursion at 8:01 a.m. ET. The pair spent six hours and 39 minutes performing maintenance along the space station’s truss structure. McClain and Hague replaced nickel-hydrogen batteries that power a section of the space station’s solar arrays with lithium-ion versions that NASA says are newer and more powerful. The agency said this work is part of a broader effort that first got underway in January 2017 to overhaul the space station’s power system. Both McClain and Hague made their spacewalking debuts during today's outing. McClain launched to the station on her first trip to space in December 2018. Hague arrived at the space station on March 14. He was originally scheduled to fly to the station in October 2018, but a rocket malfunction shortly after liftoff forced his Russian-built Soyuz capsule to make an emergency return to Earth. 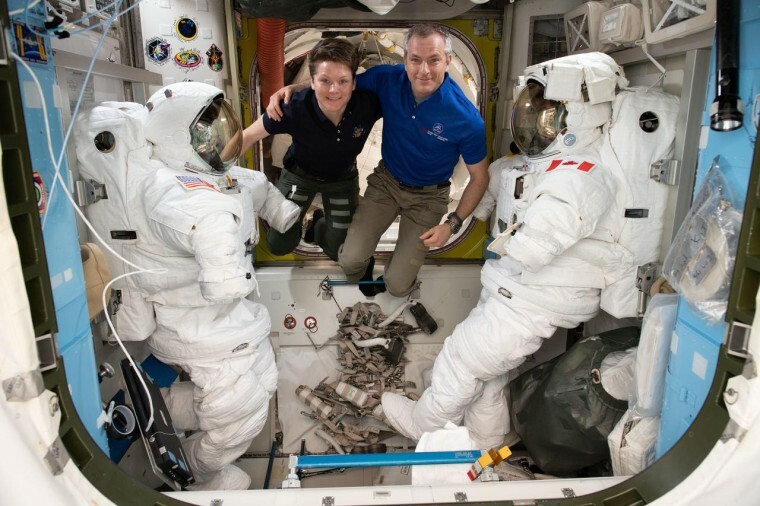 Next week, McClain will conduct her second spacewalk, but that excursion will be one for the history books. The outing will be NASA’s first all-female spacewalk. McClain will be joined on the spacewalk by fellow NASA astronaut Christina Koch and will be aided on the ground by flight directors Mary Lawrence and Kristen Facciol in Mission Control at the Johnson Space Center in Houston.